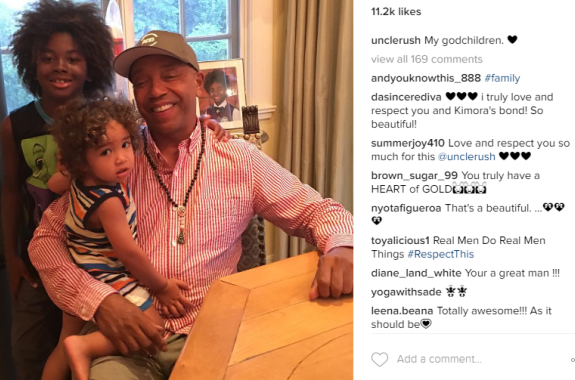 Check: Anything odd with Russell Simmons being the godfather to ex wife Kimora's kids with other men? Russell Simmons is pictured above with ex wife/model & fashion designer Kimora Lee Simmons' (she kept his name) two youngest children; Kenzo Lee and Wolf Lee. A little history: Russell met Kimora when she was 17 back in 1992 and they got married in St. Bart's on December 20, 1998. They have two daughters, Ming Lee Simmons and Aoki Lee Simmons. However, they separated in March 2006 and finalized their divorce in January 2009. Kimora went on to have a son named Kenzo Lee Hounsou with actor and model Djimon Hounsou. They were never legally married in the United States and announced their separation in November 2012. Now in February 2014, she married her third husband - Tim Leissner and they have since welcomed a baby boy named Wolfe Lee Leissner. To cut the long story shut, her first (now ex) husband shared via Instagram that he's the godfather to her other kids. He has a big heart!